If you are seeking great urban destinations, Japan is a perfect choice with its huge and busy metropolises full of things to see and do. This is your lucky day as our deal hunters have just found a cheap flight from Philadelphia to Osaka for $885 r/t with taxes included. This United Airlines flight leaves in January 2015 and it is cheaper than any other deal that we have found! 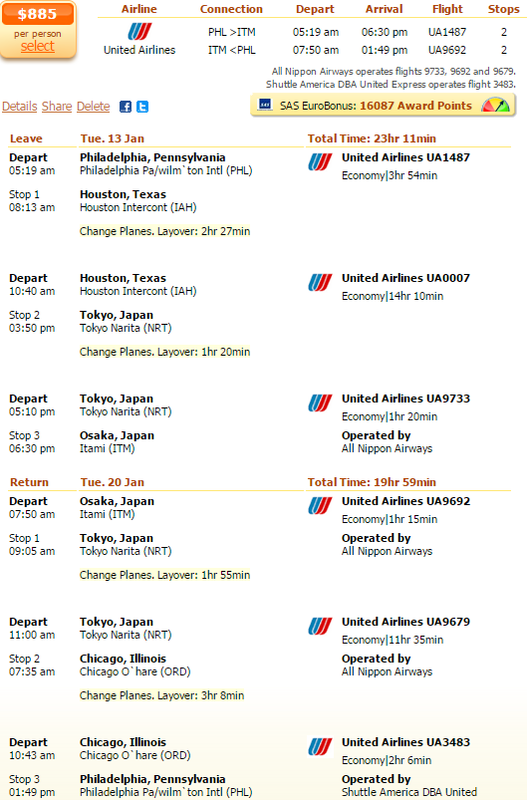 Check some of the merchants in the box and compare their prices to find this Osaka flight deal or an even better one. Note that the offer featured here was found on Travelgrove. You will start your trip from Philadelphia International Airport (PHL) on January 13 and return seven days later from Osaka International Airport (ITM). The flight has got two stops both ways, on its way to Japan in Houston and Tokyo while on the way back in Tokyo and Chicago. SAS EuroBonus will provide you with 16,087 award miles for booking this fare. This is more than 25% of a free flight between the US and Europe with the airline. The United flight we have found is nearly $30 cheaper than the next best fare we found, you can find all the deals in the table. This entry was posted on Sunday, November 23rd, 2014 at 10:49 am and is filed under Airfare Deals. You can follow any responses to this entry through the RSS 2.0 feed. You can leave a response, or trackback from your own site.